Thank goodness for long weekends. In Hong Kong, we get a total of seven Mondays or Fridays to elongate the days of rest: An extra 24 hours to explore the city, see friends, eat dim sum until we explode or just stay in and binge watch old movies. During one such recent long weekend, following a movie marathon at home, I decided to give my eyes a break from the screen and ventured out to Wan Chai’s new smokehouse and grill, Mr Brown. Located on Ship Street, Mr Brown, the newborn sister (or brother) of the much-loved Middle Eastern restaurant Francis, is described as “a Western-style barbecue restaurant with Middle Eastern touches and American grill items”. That’ll be the reason for the name then, as it stems from Southern slang and refers to the dark, smoky part of barbecued meat. My butter half cocktail, made with butter washed bourbon, salted syrup and bitters. We enter the unassuming wood-panel façade to find a dark interior warmed up by hickory-coloured leather chairs, curved booths and spotlights playfully dotted around the restaurant. Much like its predecessor, the vibe is cool and casual — a defining characteristic of co-founders James Ward, Simone Sammuri and head chef Asher Goldstein’s debut concept. The open kitchen, alongside the bar, spans the restaurant and shows off an organised and smooth-running team as guests sit front row to catch all the culinary action. If you’re lucky, you’ll catch a glimpse of the impressive meats resting on the bar table, which is reason enough to request a seat there. Here, rock music sets the mood, while upbeat hip-hop tunes slide in as the evening progresses. We’re greeted with some friendly recommendations for drinks, and I opt to go with our server’s suggestion for something refreshing. She offers Just Brew It, a craft cocktail made with gin, osmanthus tea, cucumber and mint; I’m pleased by light-hearted name, minty fragrance and cooling effect. After the first sip, however, I’m left with a sticky sweetness at the back of my throat from too much syrup, and I can’t help but swap it for another cocktail. This time. Drop It Like It’s Hot — a margarita with pink peppercorn-infused tequila — is handed to me. It’s savoury and tangy flavours bear a slight kick, and it’s definitely more palatable. Meanwhile, my date orders a 961 Lebanese beer and the spicy pale ale with herbaceous notes seem to go down well; it’s perhaps a better option to go with dinner. 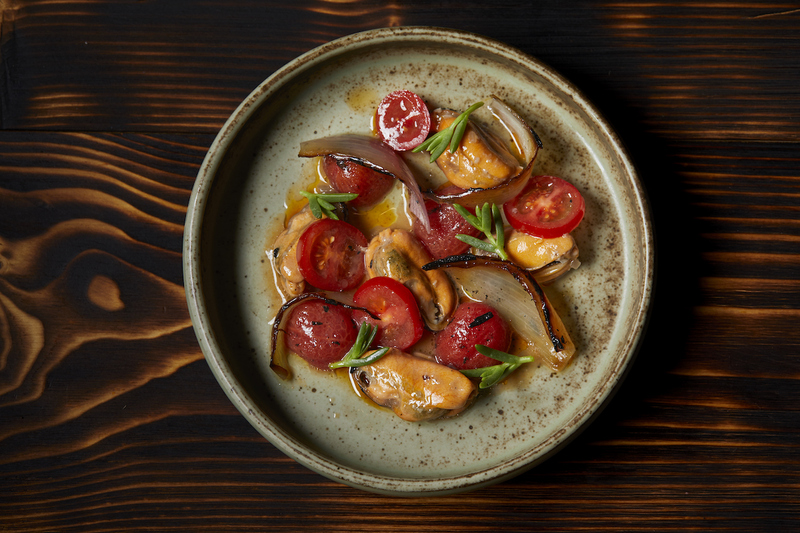 Smoked and pickled mussels, n’duja (a spicy spreadable Calabrian sausage), tomato and shallots. It doesn’t take long for the restaurant to fill up and our excitement, along with our appetites, grows. We begin eagerly and sample an assortment of items from each section: starters, vegetables, smoke & grill, and dessert. It’s a magnificent start as we nibble on smoked & pickled mussels that are brimming with flavour and a tang that lingers, as well as meaty slices of cuttlefish brought to life by the briny and piquant flavours of spicy tomato ink sauce. The Ibérico pork muffin doesn’t disappoint either, with meat smoked for six hours, plus fermented chilli aioli, mustard and pickled cabbage adding to the strong aromatics. The homemade English muffin also holds its own, allowing for a clean bite. My only wish was that there was more meat inside. Now enter the show-stopping moment with my favourite side character: kohlrabi. The vegetable, a cross between a turnip and cabbage, is thinly sliced into crunchy ribbons and charred for smokiness, then rounded off with nuttiness from shredded hazelnuts. 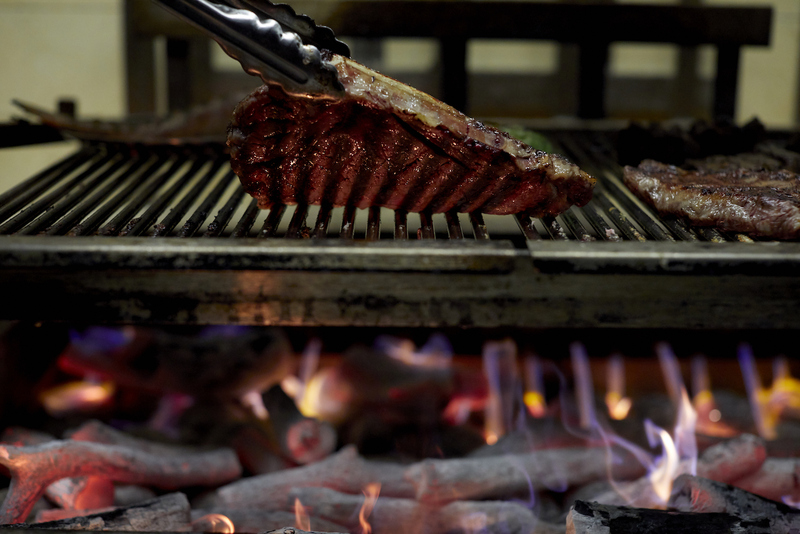 It’s a smouldering entrance which captivates our palates. We sit in awe of its smoky sorcery, because to achieve this level of flavour with a vegetable is no small feat, and I’m truly impressed by Mr Brown’s execution. Adequately prepped for the mains, we’re hit with swift and attentive service as they arrive at the table after being perfectly grilled. The brisket, smoked for 14 hours, has a black peppercorn crust and is served with a light BBQ sauce and pickles to cut through the richness. The meat is definitely tender, juicy even, but it lacked the depth of flavour we hoped for. Next, the lamb neck, which is the vehicle for some Middle Eastern spices, remains underwhelming. The accompanying green tomato salsa needs to be bolder, and the smoked aubergine could be smokier. My eyes dart to our neighbours’ smoked duck and I immediately feel food envy as they ‘ooh’ and ‘aah’ at the bird’s dark tan, a result of being coated in pomegranate molasses. 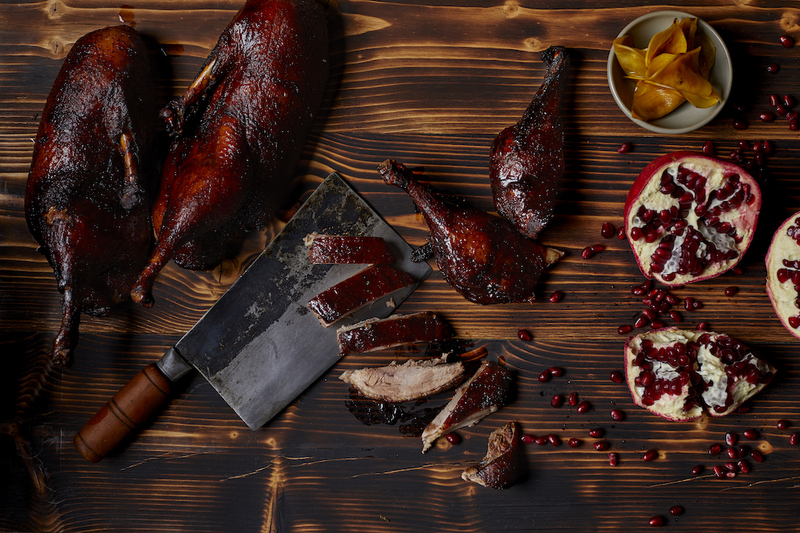 Half smoked duck, pomegranate, fennel and barbecue sauce. But before we can wallow in regret, it’s time for dessert. We opt for the caramel slice, slightly salted, with a malt hazelnut crumble and burnt meringue, which is soft like marshmallow and burnt just so to reveal slight bitter notes. The cheesecake, however, steals the show with a soufflé-like performance — it’s light, fluffy and creamy all at the same time. It’s cranked up a few notches with a sharp cherry sorbet that induces an eyes-closed moment of happiness as I surrender to the fruits of summer. On reflection, I’ve enjoyed my evening much as I would a romantic comedy. There’s love for the dessert, feel-good starters, and even an upbeat soundtrack. Sure, the main elements could be improved, but that special moment — thanks to the kohlrabi — was definitely there. 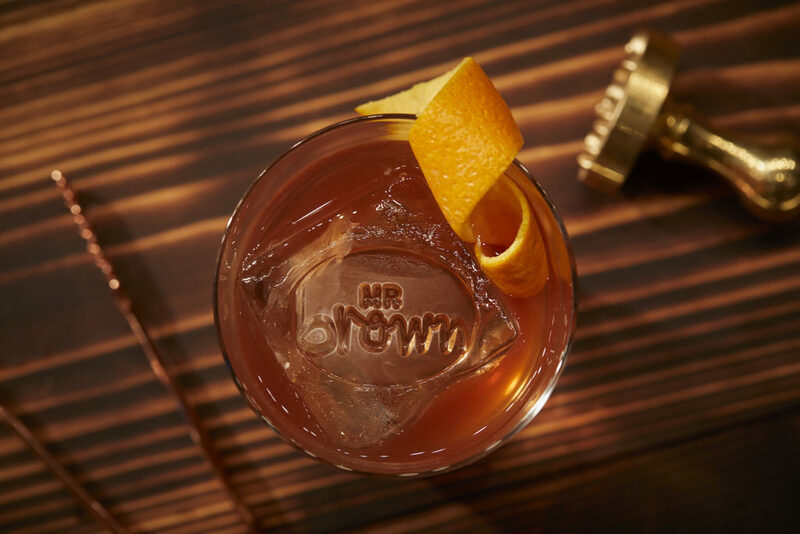 Put simply, what Mr Brown offers is a really great time. And with a few tweaks here and there, I think he may be on to a real blockbuster.